Many times people see intuition and cognition as distinct ways to decide things. In truth, they work together. The disconnection is mainly from lack of knowledge. Until 2000 intuition was not a serious study of science. The concept of emotional intelligence, created in the early 1980’s, does not even deal with it. We lacked knowledge of the unconscious too. It plays a key role in intuition. Here too emotional intelligence is silent. Failure to know the unconscious is failure to know intuition. Around 2000 this changed. Advancement in technology helped. Scientists began to see that the unconscious and intuition are powerful forces in decision making. Roles of intuition and cognition in decisions. 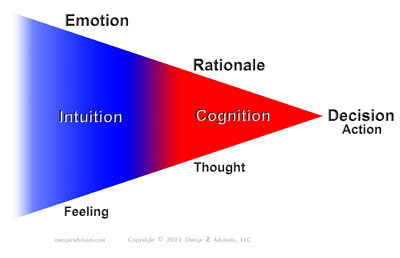 The diagram shows how intuition and cognition work together. Feelings and emotions form intuition. This fuels thoughts. It gives them direction. We rationalize our wants. Cognition helps us put together the logic for reasons. We act. A good analogy is radar. Seeing something on it is intuition. We do not know exactly what it is. We have an idea though. We know where it is. We know where to look. Seeing it with our eyes though is cognition. We can now draw conclusions. We make decisions. We act. For most of the last century, we have based decision making on a rational actor model. Whenever people propose to weigh the pluses and minuses, they are using this model. As we come to know the roles of intuition and cognition, this model falls out of favor more and more. People are not rational decision makers. We still see the model used much in economics though. What is the change? Unless we know the emotions behind decisions, we really do not understand them or the decision maker. All decisions have a strong intuitive foundation. For example, the choice to use science to prove things is based on our emotional need for security. People often ask me how to know they are using their intuition. Any kind of guessing or filling in of the blanks is a good sign. A scene from Star Trek – The Next Generation helps too. Intuition and cognition go hand in hand as night and day, rain and shine, and warm and cold do. I never thought about this process, but reading your excellent description, it seems very accurate. This is a really well-written piece. I think that most people underestimate the active role that emotions play in our cognitive processing. Regretfully, many people attempt to be “smart” by keeping their attention focused solely on logical content. This can be like being a one-eyed person who unbeknownst to him- or herself lacks detailed depth perception. It is also interesting to note that emotions (intuition) can be in response not only to external events, but also to our own logic. I have found it very helpful to learn how to support a dialogue between the emotional side of my information processing as well as the logical side. In this sense, I can obtain a kind of “stereoscopic” view of any matter of consideration. This “stereoscopic” view includes my logic, in the one hand, and my feelings, on the other hand. Perhaps I will comment more about this in a future response to another of your blogs. In the meantime, thank you for putting these concepts into words and using useful metaphors to help us to better understand what you mean. Interesting notions, and I like the message you are trying to convey. That said, I do have one disagreement with part of what you suggest, namely having to do with the mechanism you mention, which is illustrated by the diagram. I would say that emotions do not create desires or thoughts, it is the other way around. But it is a common misconception. One has a thought which, figuratively speaking, manifests emotions of a kind related to nature of the thought. I don’t believe this changes your intent or conclusion, it is more a technicality. Using your metaphor, the thought is the match and the emotion the gasoline. How we express the emotions (i.e. whether the explosion is controlled/directed or not) and how they affect our decisions depends not just on the originating thought, but on other thoughts that affect the final decision/action. Mitigating factor’s, if you will. We feel the emotions these thoughts trigger, with the emotions providing feedback to our minds. We don’t get afraid without a reason. The source of the reason is either a built int “auto-reflexive” response or it is triggered by our thoughts. I will add that while an emotion cannot create a thought it will “activate” existing thought. Manifestation happens in the downward path (thoughts to emotions ), activation in the upward (emotions to thoughts). But I could write on this for a while lol enough said. And all this is, of course. my opinion. That said,it is an area I have studied at length for a number of decades. You do not have to agree of course as I am only sharing a different take. My best to you as you try to help people! Thank you, Allan, for the compliment. I appreciate it. Yes, I can understand your view regarding thoughts as the initiator of our emotions. Perhaps we’ll just need to leave it a disagreement unless we’re just defining things differently. Assuming we are not, I still stand by my post and diagram. Ironically, it’s really the thought that thought initiates emotions that is the common misconception. Its roots lie in the formalized idea of free will in the 1500 and 1600’s and the more recent ones from positive thinking in the 1950’s and cognitive psychology in the late 60’s. Recent advancements in technology and research methodologies have made great strides in demonstrating our emotions drive thought rather than the reverse. Consider for instance, that the unconscious was proven to exist in the late 1990’s. This spawned many studies on the time lag between when a thought initiates and when it reaches consciousness. Also, neuroscience discovered that the emotional functions of the brain drive decision making. This occurred when they studied brain trauma. When cognitive functions were paralyzed, patients could still make decisions as long as the emotional aspects of their brains were intact. However, when the reverse occurred, cognitive functions intact and emotional ones paralyzed, patients could not make decisions. Nevertheless, external stimuli influence us and our emotions but this is subjective. Our personalities, the composite of our emotional makeup, will color those stimuli to fit our personality and our desires. For example, when you mention “change” and ask people to draw it, you get different drawings. 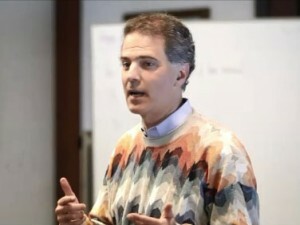 There isn’t a direct connection between the stimuli and the emotions it elicits, the thoughts these emotions generate and the final action, if any, the thoughts produce. Now, it tends to be a conclusion of thought-centric advocates that this is a matter of process. Change thought process and you change emotion to change outcomes. I call this an “education bias”; all you have to do is teach someone a new idea or way of thought and they will change how they feel about things. This is definitely not true especially if their emotions and belief construct are oriented against it. Moreover, people will tend to choose the thought process that best fits their emotional desires. Thus, emotions drive thought by driving our preferences for thought process and decision making. For example, people who have strong emotional security needs will tend to rely on evidence-based decision making process such as the scientific method. They will tend to make the safe decision. Those who have an emotional makeup more tolerant for variability, failure and experimentation, will tend to favor trial and err as a thought and decision-making process. The best example is political beliefs. We often assume that these originate because of how we stand on issues when in fact the increasing body of research clearly shows this is a function of personality which is again centered around our emotional makeup. In essence, people don’t select parties because of their issue orientation but rather by the one most in line with their emotions. That is why, if you do a good personality assessment, you can predict how people will vote with a rather high degree of certainty without even knowing where they stand on the issues. In the meantime, enjoy your day and I too wish you the best to you and those you help.